Last cable car downhill ride at 4pm. In winter season our hut is not accessible after the cable car has closed. During Winter season our hut is reachable only for winter sport guests. On the day of arrival no extra ticket is required for the ascent. During winter a reduced descents ticket is available on departure day before 10 am. (please buy on arrival day a combined ski pass ticket). Our rooms are ready on the day of arrival from about 2:30 pm. If you arrive earlier your luggage can be stored. On the day of departure, we ask our guests to vacate the rooms by 9:00 am. At Krefelder Hütte cash payment only possible !!! 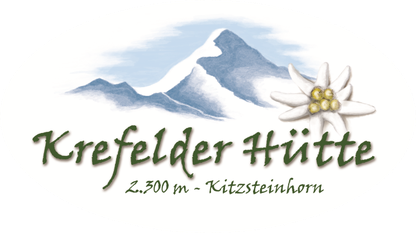 (Attention: next ATM Intersport Oberschneider Ski Dome II Shop Langwiedboden, middle station/Kitzsteinhorn). At the valley station of the Gletscherbahnen Kaprun are numerous parking spaces available for free! Due to the exposed location, the stay for children under 4 years is not recommended. We reserve us the right to any input errors and therefor subject to changes as well as any price changes.